What Can Maintenance Software Save Your Facility? With all of the different departments you manage, it’s likely you’re approached very often with requests to purchase new equipment and software from each of them. So how can you decide which investments will be worth your funds and bring in a maximum ROI. Adding an extra person to your team (at a much lower cost) + Getting 500% more usage from your equipment + avoiding insurance rate increases (and keeping everyone safe). Thinking CMMS might be the way to go? In live demo with our team you’ll see how easy it is to implement and use. You can book one at the link below, or keep scrolling for some great resources on CMMS. What does it take for you to truly achieve the maximum ROI from your maintenance department? In our eBook you’ll learn how other companies have achieved an ROI equal to a full-time employee’s salary and how you can do the same. A CMMS is an investment – but is it a worth the price? 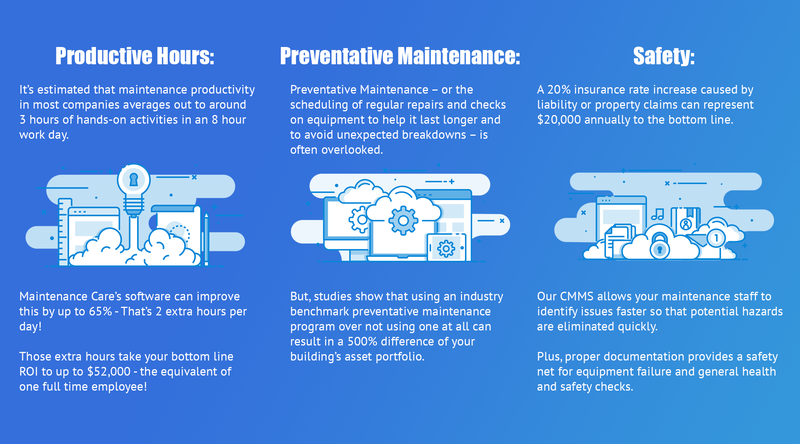 The Maintenance Care software is more affordable than you think, and you’re pretty much guaranteed to make your investment back plus more when you start using it in your maintenance department. You have a lot of different departments to manage every day, so it’s understandable that you don’t know exactly what each of your maintenance technicians does in a day. But to make an informed decision about the need for maintenance management software, you’ll need a clear picture.